ECN has recently demonstrated a new process to convert biomass and waste into valuable building blocks for the plastics industry. The process can handle almost any (cheap) feedstock ranging from non-food biomass and agricultural residues to mixed wastes. 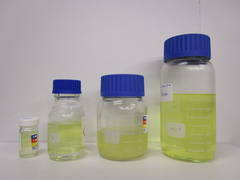 The first liter was produced in ECN laboratories in the Netherlands. The product is a mixture of the aromatic molecules Benzene, Toluene, and Xylene (or BTX for short). BTX is used to produce a range of products like insulation, beverage bottles, packaging, carpets, electronics materials. 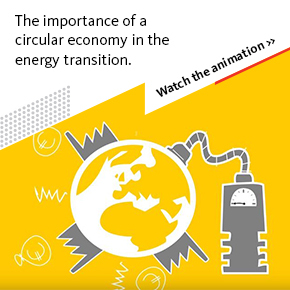 ECN’s invention to produce BTX from biomass (bioBTX) enables the chemical industry to produce green plastics for their clients, and reduces societies dependency on oil in the form of fossil based components. The possibilities for bioBTX are enormous: green coffee-cups, green insulation material, green soled sports shoes to name a few. NB: green in this context refers to plastics with significantly lower CO2 footprint. ECN has been working on the developments to produce bioBTX for many years. The process is based on thermal gasification, where solid biomass or waste is converted into gaseous components. The process was originally developed to generate green gas for use in an engine, turbine, or boiler. Recently, focus has broadened to include a multi-layered approach where green components and energy can both be produced from one feedstock. This process has now been demonstrated with a first liter of bioBTX. See also www.biobtx.com. And this is only the beginning! We have already begun to fine-tune the gasification process to make even more valuable molecules. For instance another major building block for the chemical industry: ethylene. Ethylene is used to produce poly-ethylene for plastic bags, buckets, pipes, tools, etc. Subsequently, the process will be built and operated on a larger scale to produce hundreds of tons to be used by clients for their low-cost green plastics production or for converting waste plastics back into their original building blocks. ECN is continuing developments on bioBTX and welcomes contact from stakeholders looking to join this growing group of innovators. This research has been supported by a grant from the Energy Delta Gas Research (EDGaR) program. EDGaR is co-financed by the Northern Netherlands Provinces, the European Fund for Regional Development, the Ministry of Economic Affairs and the Province of Groningen. See more at www.edgar-program.com. ECN also thanks RVO for their financial support. For more information you can contact Business Development, Biomass.